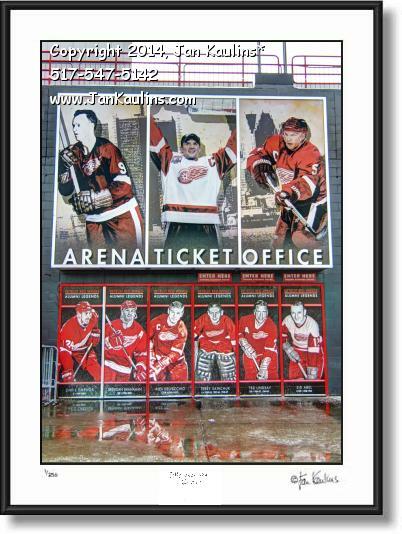 The Detroit Red Wings Photo Art Picture Gallery photo picture prints for sale. 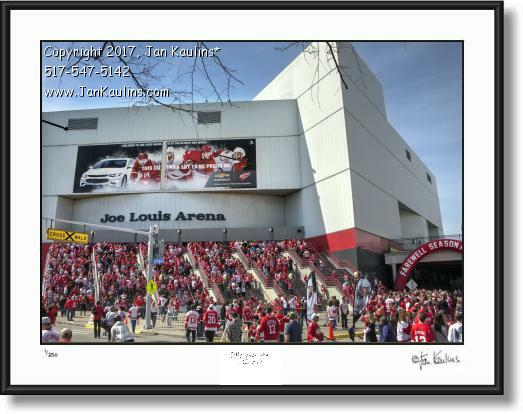 Original Detroit Red Wings art photography print photographs for sale. 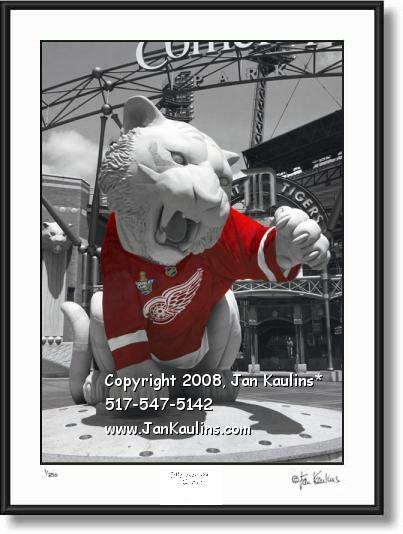 These Detroit Red Wings photos are made from original black and white photos that have been hand colored by nationally recognized artist and photographer Jan Kaulins. Some of the photos in this series are also made from 'multiple exposure' photography. 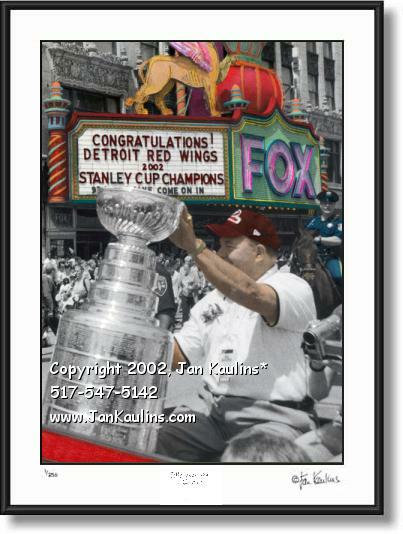 The Detroit Red Wings Art Photography Gallery pictures include photographs of Detroit Red Wings icons and landmarks, such as a very unique photo of legendary Detroit Red Wings Coach Scotty Bowman photo holding The Stanley Cup during the Detroit Red Wings 2002 Stanley Cup Victory Parade down Woodward Avenue in downtown Detroit Michigan. 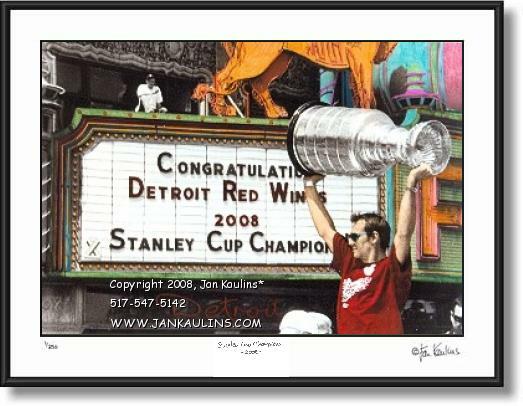 The Detroit Red Wings Art Photography Gallery also includes a photo of Dominik Hasek, The Dominator, and Detroit Red Wings top Goalie, in the 2002 Red Wings Victory Parade photo. 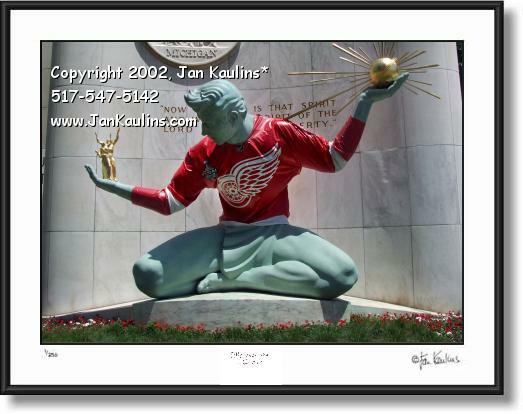 There is also an excellent Detroit Red Wings Spirit of Detroit statue photo of The Spirit of Detroit draped with the Hockeytown Detroit Red Wings jersey during The Stanley Cup playoffs. 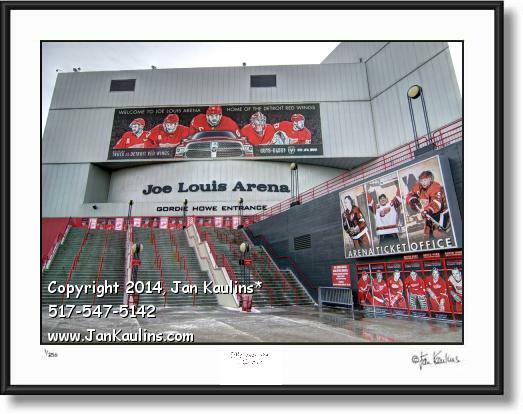 The Detroit Red Wings Photo Gallery also includes the Capt. 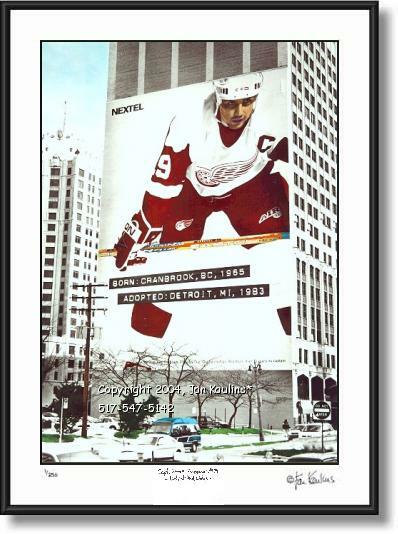 Steve Yzerman mural photo in downtown Detroit. 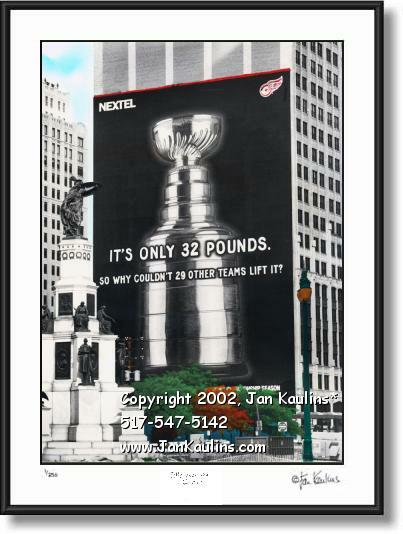 There is also a rare photo of the giant size painted Stanley Cup mural photo that was briefly on the Cadillac Towers skyscraper wall that is now occupied by the Steve Yzerman mural. 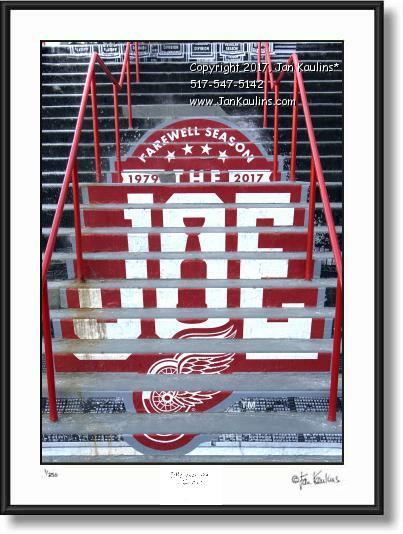 Many fans didn't even see this Stanley Cup mural, a tribute to the Stanley Cup winning Red Wings, because it was up for such a short time. 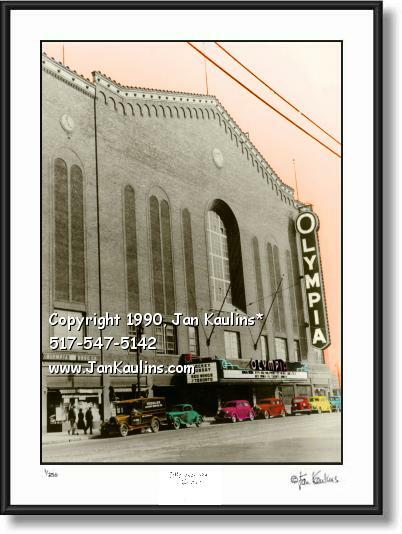 Also included in The Detroit Red Wings Photo Art Gallery are vintage historic photographs of old Detroit Olympia Stadium with The Stanley Cup Playoffs on the marquee. 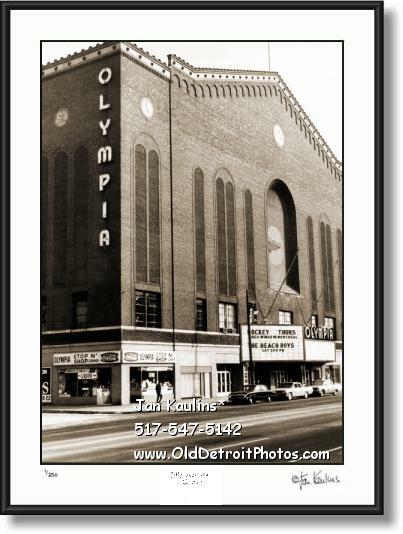 This Olympia Stadium shows the Detroit Hockey arena that was the original Detroit home of The Detroit Red Wings. 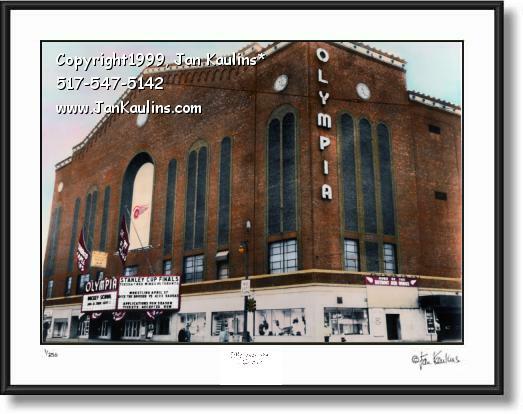 There is a Detroit Olympia Stadium picture photo from the late 1930's and another Olympia Stadium photograph from the early 1960's. 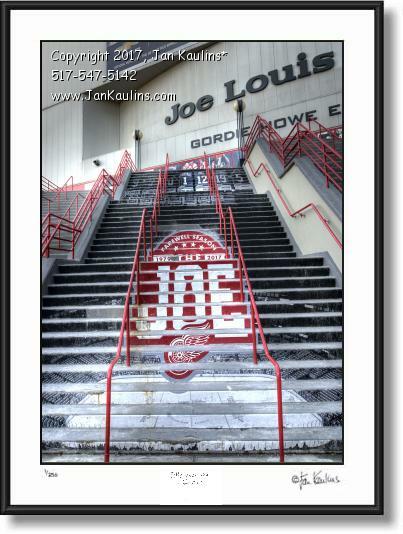 There is also a Detroit Red Wings photo of the current home of the Stanley Cup Championship winning Detroit Red Wings -- The Joe Louis Arena, know fondly to fans as 'The Joe.' 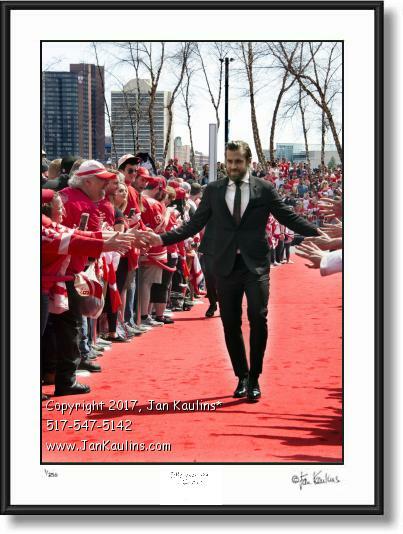 The original hand-colored black and white photographs in this Official Detroit Red Wings Photo Gallery website celebrate the City of Detroit as well as one of Detroit's finest sports teams--The Detroit Red Wings. 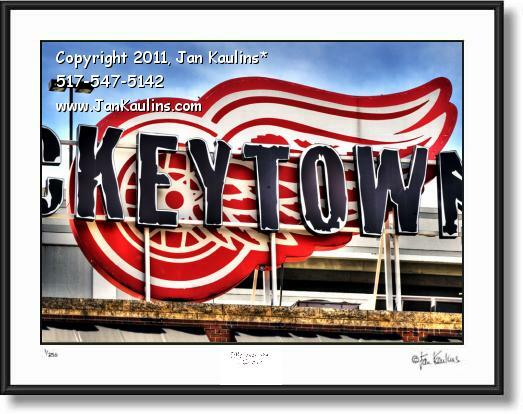 Made in Michigan photo art print craft goods products for sale. Support Made in Michigan arts, photography, prints and crafts for sale. 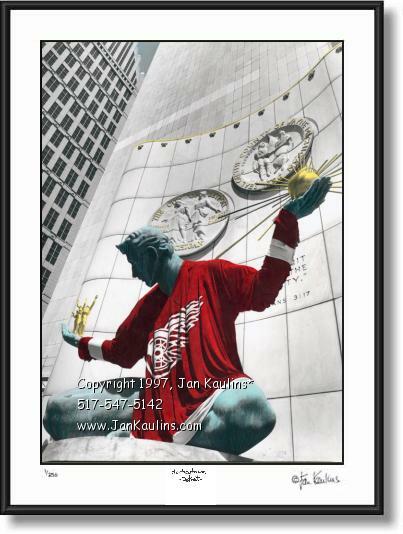 Michigan made fine art photo fine-art print photography for sale. 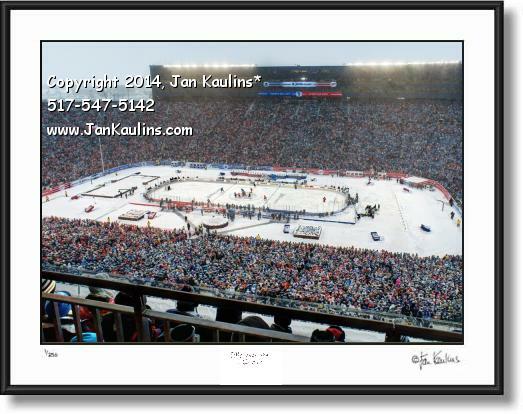 BUY Michigan Made art and gifts on this website. Buy AMERICAN MADE AND BUY MICHIGAN MADE products, art, gifts, and goods and services.